04.17.11 The tournaments in Aroostook County keep on rolling thanks to tournament organizers and directors Roger and Lois Morin and the willing participants. This event, the 6th Houlton Open, was won by Roger Morin. Lance Beloungie and Joshua Burden finsihed tied for second. 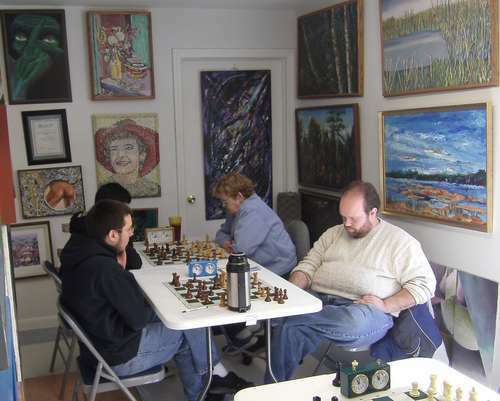 Here are some images from the tournament the USCF crosstable. 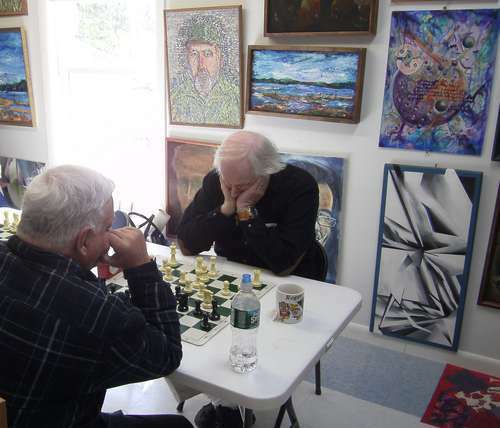 Tournament winner Roger Morin (right) plays Ray Haines in the second round of the 6th Houlton Open played in Houlton on March 19, 2011. Roger Morin topped the eight player field with 3.5 points in four games. Equal second place finisher Lance Beloungie, the only player to nick Morin for a draw, scored 3.0 points along with Joshua Burden. Roger Hardison, Craig Fournier, Lois Morin and Andy Chan all scored 1.0 point apiece and Ray Haines rounded out the crosstable with half a point. Lance Beloungie (right, playing the white pieces) focuses on his position in his game vs Roger Hardison in round 2. The result was 1-0. Round 2 action: Equal second place finisher Andy Chan (rear left) plays Lois Morin while Joshua Burden (front left) plays Craig Fournier.